The book includes biographies of many of the painters. The standard reference on the subject in what is now a keenly-collected field. Illustrated throughout in color and with a dual text in English and Chinese. Qianjiang painting is landscape painting outlined with ink and complemented by pale umber. It lends itself well to porcelain decoration. Qianjiang painting on porcelain flourished in the latter half of the 19th century. Objects decorated in this style includes brushpots, plaques, teawares, bowls, hatstands etc. The style is a Yuan Dynasty literati painting style, introduced on porcelains around in the late Qing Dynasty up to early Republic Period mainly for painting landscapes with mountains (Shan) and waters (Shui) in a particular color scheme: ink for mass, tree trunks and areas in the shade, and a reddish brown for foliage, water and elements in the light. On porcelain the painting was drafted with black and completed with washes of thin enamels in muted colors. The subjects depicted are varied and besides landscapes, human figures, and ‘birds and flowers’ occurs. This combination resulted in paintings that are pale in coloration and delicate in feeling, in sharp contrast to the richly almost gaudily painted porcelain of the time. The pioneers and most famous qianjiang painters on porcelain in the Tongzhi (1862-1874) and Guangxu (1875-1908) periods were Wang Shaowei, Jin Pinqing and Chen Men. 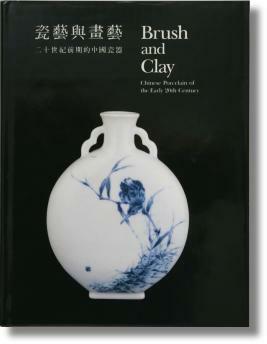 It is thought that both Jin and Wang worked for the Imperial porcelain factory during these eras. for outlines on Qianjiang, the cobalt pigment is mixed with a sparse amount of lead glaze substance and applied directly to the glazed porcelain surface, while for fencai the black cobalt outlines can be covered with a layer of a transparent lead-based substance so that it would be protected and adhere better to the glaze after firing. Due to the difference with application technique, fencai black can be glossy and appear darker while that on Qianjiang is mostly pale black in color and easily wears off. For fencai or “Famille Rose”, this palette was based on Canton enamels on copper where the typical technique was that, before any colors could be applied, an arsenic-based opaque white pigment was first applied to the area to be colored. Than any colored enamel applied on top of this could be brushed out to give tonal gradations. This beside the style and color palette as such (including pink rose color based on gold), this is the deciding definition for famille rose. However, for Qianjiang, the enamel was to a much lesser extent applied on top of a white base, but rather directly on the white glazed porcelain surface, giving the decoration the appearance of watercolor painting on silk or paper – which probably was the purpose. Although many of these accomplished painters and calligraphers were active during the late 19th century and well into the 20th century very few records about them seems to be left. Unfortunately, not many of their work seem to have survived either. One of the reasons beside these masters habit of mixing their own enamels to their own specifications, being that these enamels also have a tendency to fade and wear off very easily. One Response to “Brush and Clay.